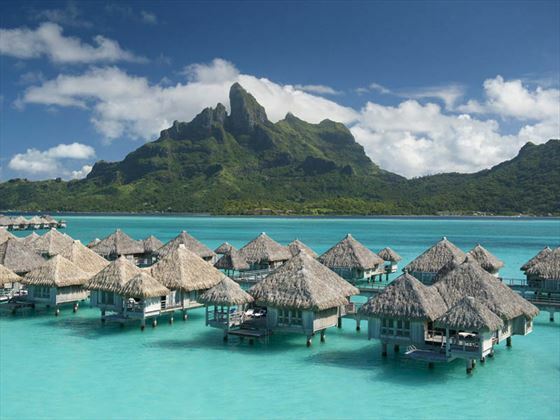 Nestled close by to the emerald green hills of Mount Otemanu, St Regis Bora Bora offers a scenic escape where seclusion is key. 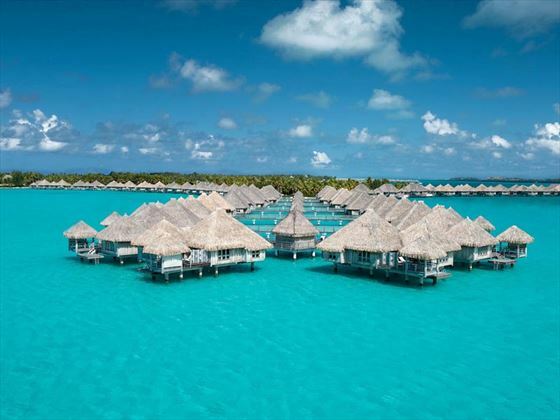 Found along the northern coastline of Bora Bora, you’ll be treated to the most spectacular views of translucent lagoons and lush swaying palms. We’re sure you’ll love the thatched roof villas here, all adopting a touch of Polynesian charm and located either right on the beach, or over the turquoise waters. For an extra je ne sais quoi, you could indulge in the beautiful Royal Estate, giving you the utmost privacy and even your own slice of beach. 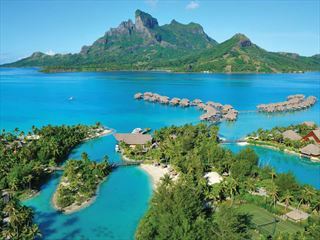 As with any French Polynesian oasis, you can do however much or little as you like when visiting St Regis Bora Bora. Take a dip in one of the two pools, or wander along to the beach for an afternoon of paddle boarding and kayaking. They even offer complimentary snorkel equipment and bicycles that you can keep for your entire stay. If relaxing is more your forte, the Mira Mira Spa is a calming spa that sits in the middle of the azure lagoon. 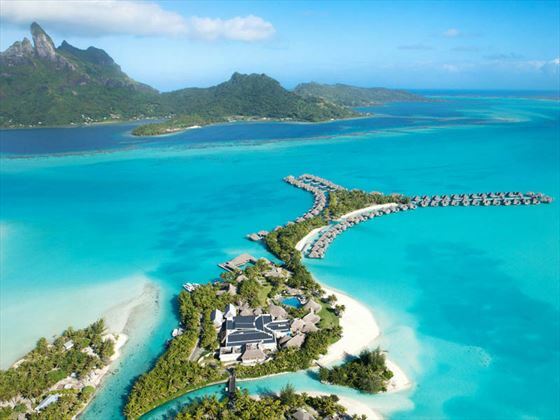 Located on the northern fringes of Bora Bora at Motu Ome'e, a 50 minute flight from the mail island of Tahiti followed by a short 30 minute boat ride to the resort's luxurious hideaway. A plethroa of room options allow you to choose what suits you best. Or stay in two different types of accomodation whislt staying here. Reefside Garden Pool Villa and Reefside Royal Garden Two Bed Villa - Luxuriously designed in exotic woods and marble, the Reefsde Garden Pool Villa features a large separate lounge with a daybed nook and bedroom with an adjoining bathroom that opens into a private garden with an outdoor shower. A more spacious coral-pink hued stone terrace with a dining gazebo and refreshing pool completes this picture of tropical elegance. The two bed villa has the same vista and location but is of course bigger with two separate bedrooms. Beachside Pool Villa - Set amidst palms the Beachside Pool Villa offers direct access to powdery white sands and gentle waves of the resort’s calm bay. The Beachside Pool Villa is a suite featuring a separate lounge and bedroom with an adjoining bathroom that opens into a private garden equipped with an outdoor shower. A spacious terrace with a dining gazebo and a refreshing plunge pool overlooking Bora Bora’s stunning lagoon makes this an idyllic choice. Overwater Superior Villas - Jutting out over the lagoon from the main beach, these villas have amazing views of the gorgeous bay. Glass viewing panels in the villas allow you to see the turquoise waters below. 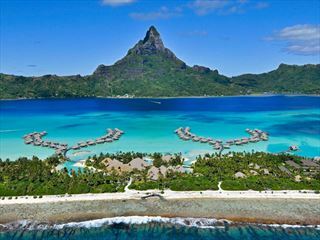 Overwater Deluxe Villas - These villas feature the same amenities as before, this time facing the main island for the added view of Bora Bora's skyline. 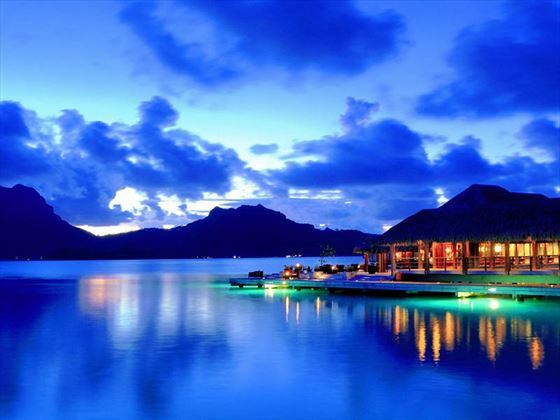 Overwater Deluxe Otemanu Villas - Located further out on the pontoon with guaranteed views of Bora Bora's iconic Mount Otemanu. 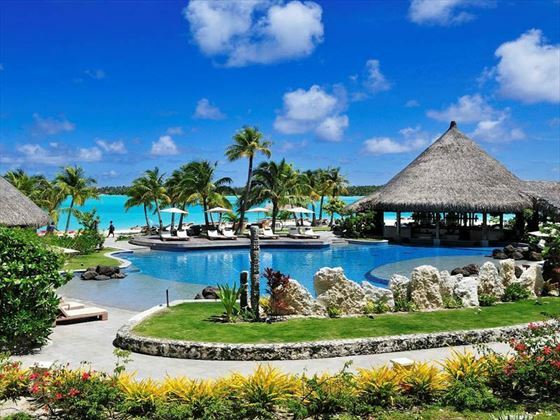 The Royal Estate - This is the largest Villa in the South Pacific and the ultimate place to stay with its own private beach facing Bora Bora's sparkling lagoon. A dedicated butler service is also provided. Lagoon by Jean Georges - The resorts signature restauarnt blending French and Asian cuisine with outstanding results. This is a real treat for the taste buds. Bam Boo - A more casual dining experience with sushi and fresh fish. Far Niente Ristorante - For mouthwatering Italian specialities and a welcoming atmosphere. Aparima Bar - Light fare and fabulous cocktails plus a great spot to watch the sunset.